The 91.57 downside target we were using for the dollar looked promising as a place for a powerful bounce to occur. Instead, sellers crushed it on Friday, putting in play a significantly lower target at 88.29 that I would rate as almost certain to be reached. If so, it would add 2.9% to the Dollar Index’s so far 12.4% decline from the 103.82 high recorded a year ago. It would also undoubtedly quicken the inflation drumbeat we’ve been hearing recently from the usual, benighted sources — i.e., the news media, professional economists and talking heads. I expect my new target, a clear and compelling Hidden Pivot support, to resist sellers for a while, at least. 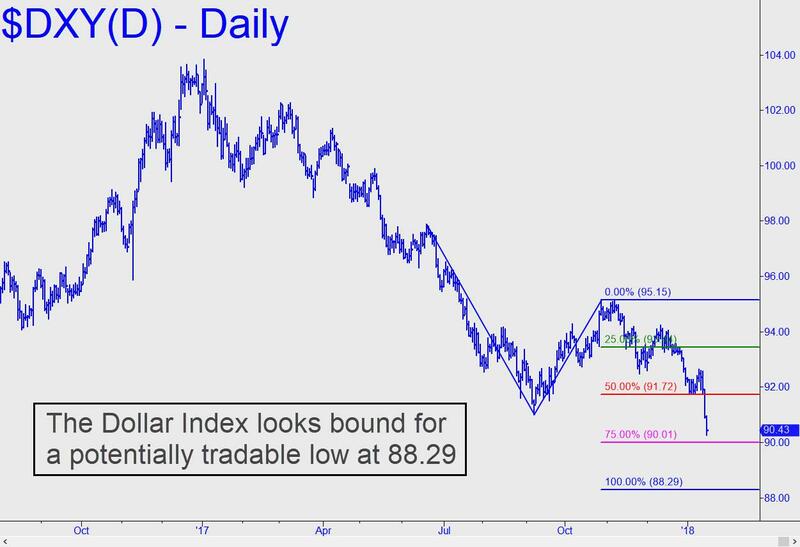 But if it gives way relatively quickly — and by that I mean within a day or two of first being touched — I would infer that the U.S. dollar is headed significantly lower. At the same time, we could expect to see the continuation of some big trends, including lower prices for Treasury bond and notes, and higher prices for stocks, crude oil, precious metals and of course bitcoin.